Girl jumps onto boy's ooc skateboard as he falls off, lovely, he's impressed not threatened. I've been looking up names as words in Urban Dictionary. I think I've got a different schema starting. I'm not sure yet, but there are symptoms. I've been making a file index of all the fictional people in our roleplaying game and didn't colour code the cards, although I had two colours. I've been enjoying tidying the Lego (sorting by size and shape into clear boxes and putting the boxes into bigger boxes) as much as or more than making stuff with it until tonight. 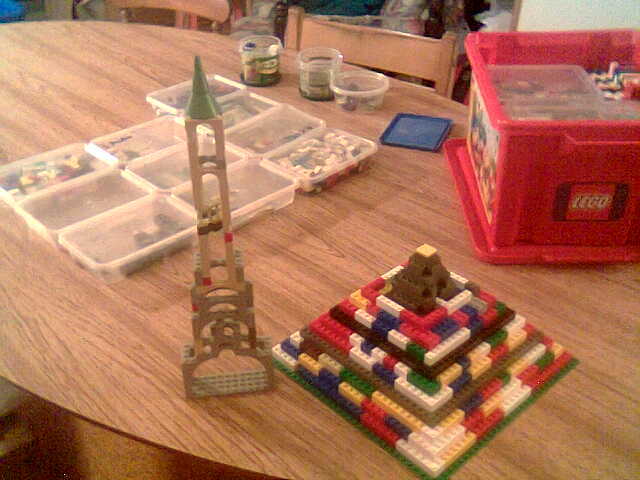 Tonight I invented the Lego graph: a bar chart you can feel the differences between! But I didn't want it to have anything but yellow Lego in the bars. Tonight I covered a four by twelve flat grey with yellow Lego, and covering that with more and more yellow Lego, filling in the space lots of different ways. It was so beautiful I had to put it in my mouth. And last night three of my friends wore matching magenta tops with concentric silver stars to the party and every time they gathered together I got a special replete feeling and I just wanted them to be near me the whole party in their colour co-ordinated beauty (despite temptation I made do with a magenta sparkle, thanks for your concern). Child to fidgetting Dad: You shouldn't have your latte until you've tried to pee.